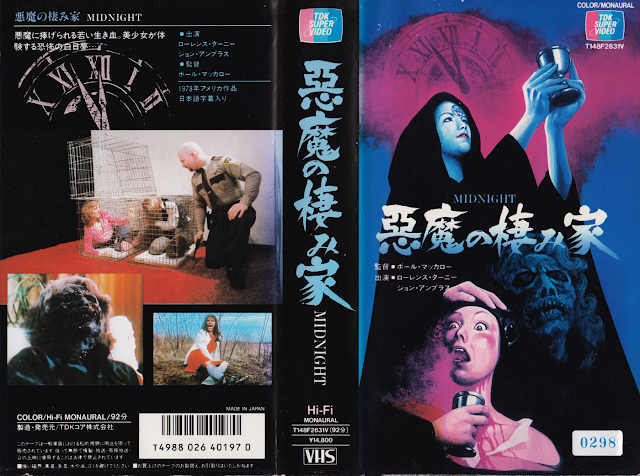 To accompany this standard slipcase edition scanned last February, here's the very scarce clamshell version of Midnight (1982) from TDK Super Video. The distributor issued several of their cult slipcase titles in sleeves with different artwork, like Nightmare City (1980) and Killer's Curse (Nurse Sherri) (1978). It's still unclear if all of these plastic-cased variants have been accounted for since a few like Killer's Curse have only surfaced once in collector circles. That coverart makes me horny. Im pretty sure all TDK Slipcases were re-released with sleeves. Nightmare is definitely one of the rarest. Unfortunately the Japanese vhs release is cut.